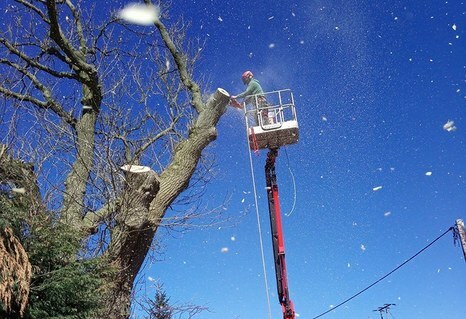 High Reaching Solutions assist our arborist clients on a regular basis, especially when it comes to working on dangerous trees. 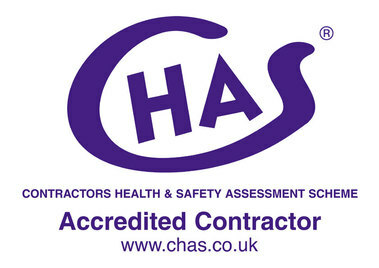 Tree surgeons would much rather be safe and use one of our ‘ladies’ than risk injury or even death, and rightly so. What would constitute a DANGEROUS TREE? And it’s not just the tree itself, it’s where it may fall if nothing is done that needs taking into consideration. In the accompanying photos you can see not only the challenge of the tree for Nick, but also the awkward terrain that Sabrina had to deal with. If you have a dangerous or awkward tree or large hedge to contend with in the North Yorkshire area then give Nick a call on 07855780512. Nick, owner of N Dean Tree and Garden Services of Malton, North Yorkshire, needed the services of Sabrina, our Platform Basket RQG150 tracked spider to assist in safely felling a dangerous tree in Thornton-Le-Dale. 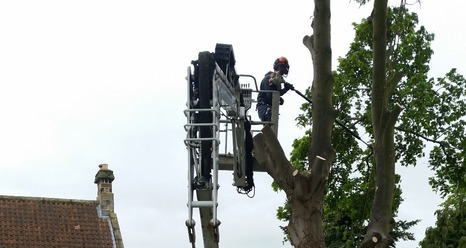 They needed a cherry picker which could go through a small gate, travel on uneven and boggy terrain and give good height and outreach as the tree was not only in a poor condition to climb but also encroached over a neighbouring property. 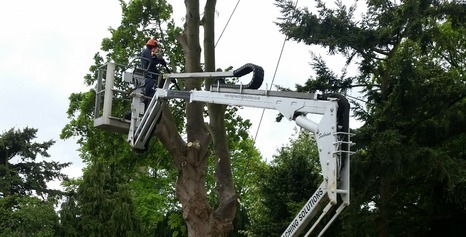 Jack of Ridgwick Tree Services had arranged with the local council for a road closure as Sophie needed to be positioned in the road for some of the work and in a private garden to gain access to the opposite side of the large tree. The accompanying photos show the awkwardness of this tree in respect of its location and close proximity to structures around it. 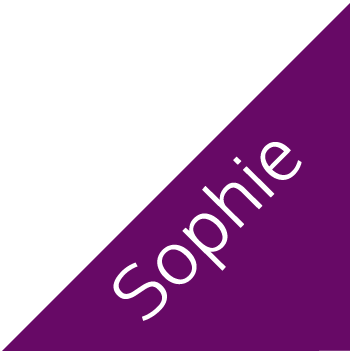 The fantastic photo of Sophie in the road was taken by a member of Ridgwick Tree Services and they have kindly given their permission for High Reaching Solutions to use it. 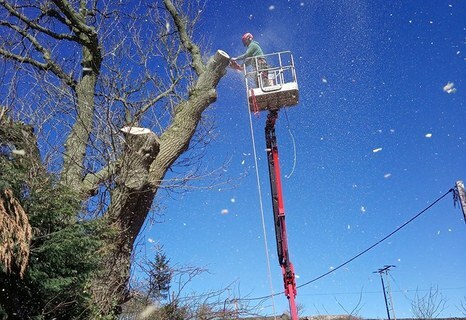 If you require the services of a Tree Surgeon in the West Yorkshire area then give Jack a call on 07584322946. High Reaching Solutions are not just a local company, we travel all over the UK and one of our arborist clients in Penistone, West Yorkshire, Ridgwick Tree Services required the services of Sophie, our Platform Basket 18.90 Pro tracked spider. They had a dangerous tree to make safe, it was rotting from the inside out, was in danger of falling across the road and onto homes opposite and was positioned very close to livestock pens. 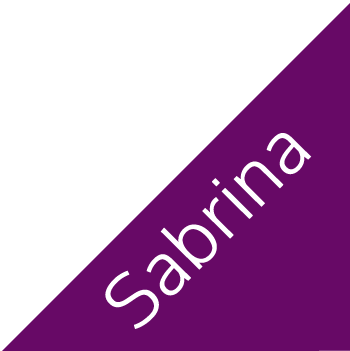 And if you require the services of Sabrina or Sophie or one of their sisters to enable you or your contractors to work safely at height then please do get in touch with us either via our contact page or simply phone 0845 313 8420. 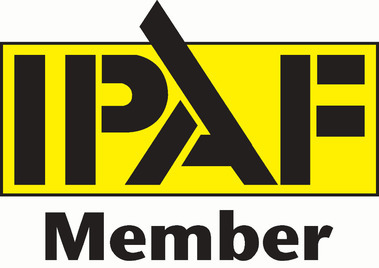 We are always here to assist and offer advice on working at height safely.